Attached kindly find herewith my addenda/reaction to the article of Mr. Arun Babani, titled as 'What makes me a Sindhi?' 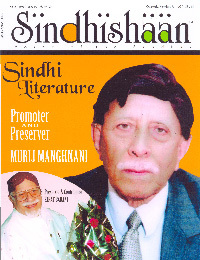 printed in Sindhishaan's Oct-Dec 2006 issue. By printing in white and yellow letters against red background, you have provided him a higher pedestal to reach upto the readers. To me it looks odd and unjustified, anyhow, you have the exclusive prerogative and you are the best judge to decide on such matters. Arun Babani says that he cannot be called a Sindhi as he was not born in Sindh. A Sindhi is a Sindhi not because he takes birth in Sindh but because he is born in a Sindhi household, he speaks Sindhi and he believes in Sindhiat or Sindhism. A lot of Gujarati speaking people have taken birth in Mumbai, London or New York but they feel proud of calling themselves Gujarati, not otherwise. Rather they emphasise that, "Jian Vase Gujarati, tiyan vase Gujarat". A father, mother and their children make family. People speaking same language, observing similar traditions make a community. A person is known through his name, father's name and family name. Human beings are not just products to be assigned numbers. The very identification of a person classifies him to belong to one specific community. Whether one likes it or not he is bound by these basics as one cannot live in annonymity. Whether Arun Babani likes himself to be called Mumbaikar or a Sindhi, it is one and same because even in this case he is being labelled as one or the other. His words smack of inferiority complex in Indian Sindhis which every Sindhi should try to get rid off. As far as faith in Sufi traditions is concerned - which other Indian community, as compared to Sindhis, truly believes in it or practices it? The ten Sikh Gurus had propagated the message of Sufism through their own renditions or through couplets of other Sufi saints like Khwaja Ghulam Farid or Baba Bule Shah or even Sant Kabir in Guru Granth Saheb but the end result is there for everyone to see. The Sikhs even after reposing faith in Guru Granth Saheb feel proud to be termed as Marshal community. It is only Sindhi community which has truly imbibed the tenets of Sikh Gurus. Whether a person likes it or not, he will be classified one or another. When Arun Babani wishes people to be free from any such baggage, it looks like he is suffering from 'Utopia' syndrome because such state doesn't exist anywhere and just longing for this state of mind is not going to solve the problem. The good and evil traits are always at loggerhead within human being. A person with evil intentions will, even otherwise, devise various excuses to wreack havoc in others' lives, be it a difference of language, religion, caste, race, colour, or community. By just wishing or disowning our community bonds is not going to rid human beings of their evil designs, rather it would be better to own it, live with it and learn tolerance and respect for people of other communities, caste. religions, colour and races. Mr. Arun Babani's contentions that 'Religious communities and caste are slowly dying doesn't hold ground against the backdrop of reality. Take a look at today's world, fanatism has raised its ugly head and there are talks of the clash of civilisations. Tolerance is the only remedy for fanaticism and who better than a Sindhi can display it. A peek at history would vouch for that. At the time of Partition, Sindh was the only province of India free of communal violence. I admit that it is this compassion inherent in Sindhi genes that compels Arun Babani to declare that Sindhis can be harbingers of universal Ruhaniyat, but history doesn't support such attitude because we and our language have been sacrificed at the altar of nationalism in India and at religion in Pakistan. Had Sindhis also sought a piece of Sindh at the time of Independence of India, the scenario would have been altogether different and then Arun Babani would not have to say, "I am not a Sindhi".